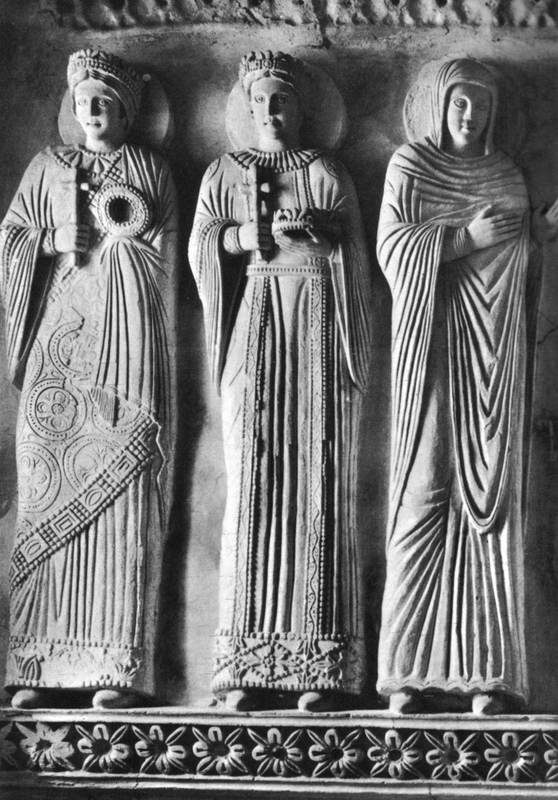 While looking for artwork to accompany a future post about Charlemagne’s second wife, I came across this photo of stucco sculptures in the Lombard Temple (associated with the Santa Maria in Vallee Monastery) in Fruili, Italy. None of these women is the Lombard princess Frankish King Charles repudiated. Instead, they represent holy martyrs. So why use a photo of these women? Images of the Lombard princess are hard to come by; we don’t even know with certainty what her name was. The temple these sculptures reside in dates back to the eighth century, about the same time as the princess, and according to a caption of a similar photo in Wikimedia Commons, these sculptures above an eighth-century fresco are from the same period. Medieval artists clothed their characters in contemporary garb no matter what century the event happened. The clothing on the sculptures, rendered in beautiful detail, is consistent with Frankish fashion from this era – long loose sleeves over tighter sleeves, girdles, underskirts. Might the Lombard princess have worn something like the clothing and headdresses shown here and styled her hair in a similar way? Might she have similar facial features? The sculptures give us tantalizing clues.